In this tutorial for Photoshop CS6 users, we'll take a tour of the Camera Raw interface and learn where all of the various tools, panels and other features are located, so you can begin processing your raw, JPEG or even TIFF images in Adobe Camera Raw with all of the simplicity, freedom and flexibility it offers. Once we're familiar with Camera Raw's interface, we can then begin looking in much more detail at how to process, correct and retouch our images as we'll do in the next tutorials. To view all of the updates available in Photoshop, go to Help > Updates. However (and this is a big "however"), there's a catch. 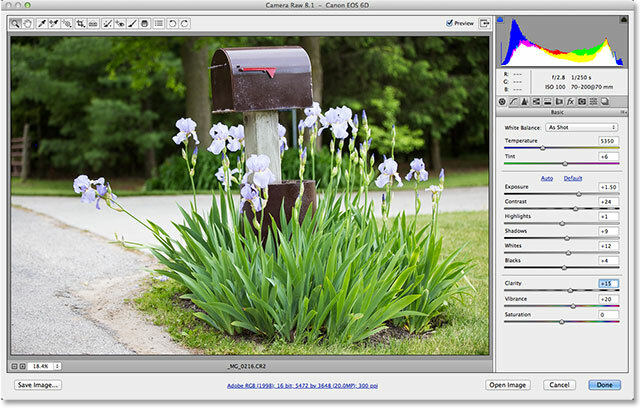 The version of Camera Raw 8 that Adobe has made available to Photoshop CS6 users is mainly to fix various bugs from Camera Raw 7 and make Camera Raw compatible with both high resolution displays and the latest digital cameras and lenses. While that's great, the CS6 version of Camera Raw 8 is missing the new features available exclusively to Photoshop CC (Creative Cloud) subscribers, like the new Radial Filter, the improved Spot Healing brush, and the new Upright options for easy perspective correction. 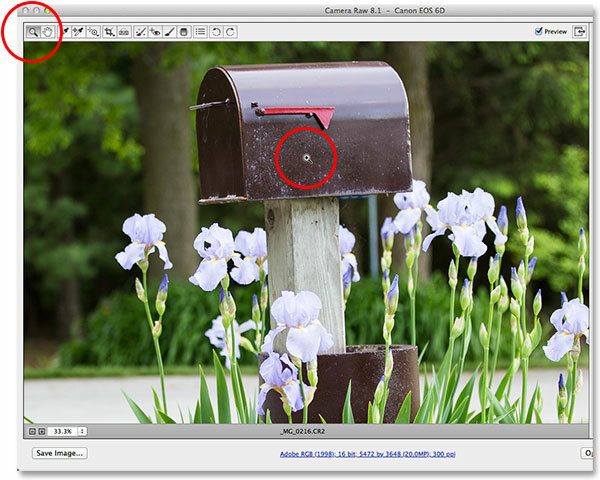 Also, Photoshop CS6 itself is missing the new Camera Raw filter that's been added to Photoshop CC. So, that's just something to keep in mind. If you want the brand new features in Camera Raw 8, you'll need to upgrade to Photoshop CC by subscribing to the Adobe Creative Cloud. 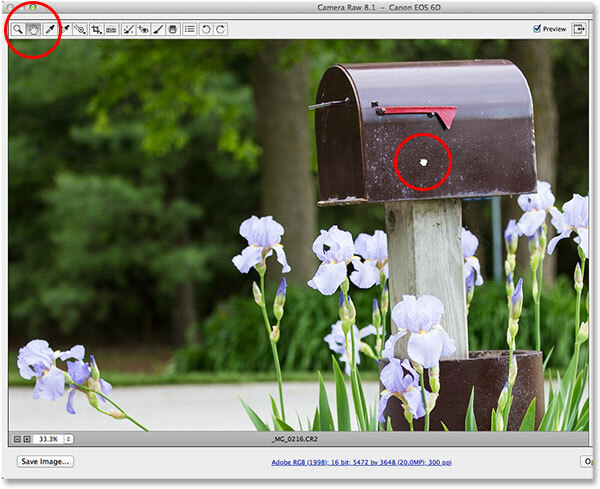 I'll be covering these new features in separate tutorials but for this tutorial, we're going to look specifically at the version of Camera Raw 8 that's available with Photoshop CS6. Clicking on the photo I want to open to select it. The Toolbar is located along the top above the preview area. 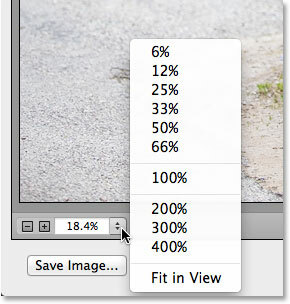 The Camera Raw Preferences dialog box. Clicking the Zoom Tool to select it, then clicking on the photo to zoom in. Clicking the current zoom level to open a menu of zoom presets. We can zoom in and out of the preview area from the keyboard as well. Press Ctrl+plus sign (+) (Win) / Command+plus sign (+) (Mac) to zoom in, or Ctrl+minus sign (-) (Win) / Command+minus sign (-) (Mac) to zoom out. Pressing Ctrl+0 (Win) / Command+0 (Mac) will instantly fit the image to the preview area, while Ctrl+Alt+0 (Win) / Command+Option+0 (Mac) will jump to the 100% zoom level. Selecting the Hand Tool, then clicking on the image and dragging it in the preview area. The Histogram shows where the current brightness range falls in the image. Switch between panels by clicking on the tabs. The Basic panel is essentially the main panel in Camera Raw. The HSL / Grayscale panel. Most people will never have a use for the main purpose of the Camera Calibration panel, which is to give us a way to compensate for problems in the way our camera captures color. We have separate Hue and Saturation sliders for each of the three primary colors of light (red, green and blue) as well as a Tint slider for adjusting shadows. However, if you've been noticing a color cast problem with your camera, you'd be much better off running some tests and repairing or replacing the camera if needed, rather than trying to compensate for the issue here. There's also a Process option at the top of the panel which allows us to switch from Camera Raw's most recent image processing engine (2012 in this case) to the older 2010 or 2003 engines. Other than for the sake of comparison, you probably won't find much use for this option, either. The final two panels in Camera Raw are the Presets and Snapshots panels. The Presets panel allows us to save the settings we've used with one image as a preset that we can instantly apply to other images simply by choosing the preset from the list. It's a bit like creating actions in Photoshop but much, much simpler. 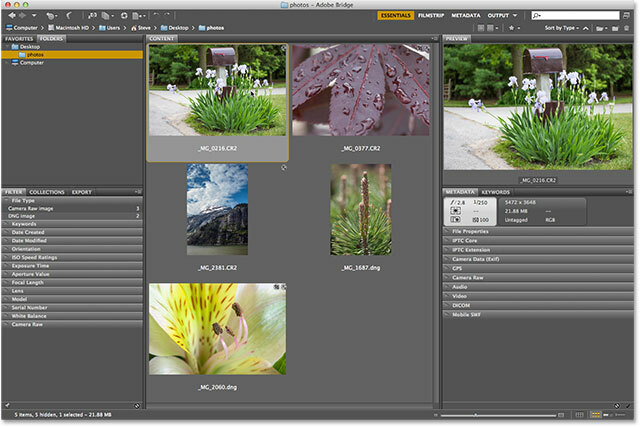 The Snapshots panel is similar to the snapshot feature in Photoshop's History panel. At any time while we're working on an image in Camera Raw, we can save a snapshot of our work, which will save all of our settings up to that point. We can then instantly revert back to that point at any time if we need to just by choosing the snapshot. Both of these panels are empty by default (until we actually save a preset or snapshot) so I won't bother with screenshots, but you can easily switch to them yourself to check them out by clicking on their tabs (Presets is the second panel from the right, Snapshots is the very last panel on the right). Every panel in Camera Raw, with the exception of the Snapshots panel on the far right, can be easily selected from the keyboard. Simply hold down your Ctrl+Alt (Win) / Command+Option (Mac) keys and press a number key. Press 1 for the Basic panel, 2 for Tone Curve, 3 for Detail, 4 for HSL / Grayscale, 5 for Split Toning, 6 for Lens Correction, 7 for FX, and 8 for the Presets panel. Note, though, that the Preview option is panel-specific, meaning it only affects the currently active panel. For example, if you make changes in the Basic panel, then switch to the Tone Curve panel and toggle the preview off, nothing will happen because all of your changes were made in the Basic panel, not the Tone Curve panel. You would need to switch back to the Basic panel to see the "before and after" comparison of those changes. To toggle the preview on and off for all the panels at once, first switch to either the Presets or Snapshots panels, then press the letter P on your keyboard. The Workflow Options dialog box. The Cancel button closes Camera Raw without saving anything you've done. To reset the panels back to the way they were when you opened Camera Raw, clearing away any work you've done to the image since then but leaving the image and Camera Raw open on your screen, press and hold the Alt (Win) / Option (Mac) key on your keyboard. This will change the Cancel button to Reset. Then, click the Reset button. The Reset button resets the panels but leaves Camera Raw open. And there we have it! That's our whirlwind tour of the Camera Raw interface, and specifically the new Camera Raw 8 interface, in Photoshop CS6! Check out our Photo Retouching section for more Photoshop image editing tutorials!